that is a wooden floor surface, consisting of a great number of separate details of different forms, usually - rectilineal, and species of wood, made and collected as a unit in accordance with the artistic design. 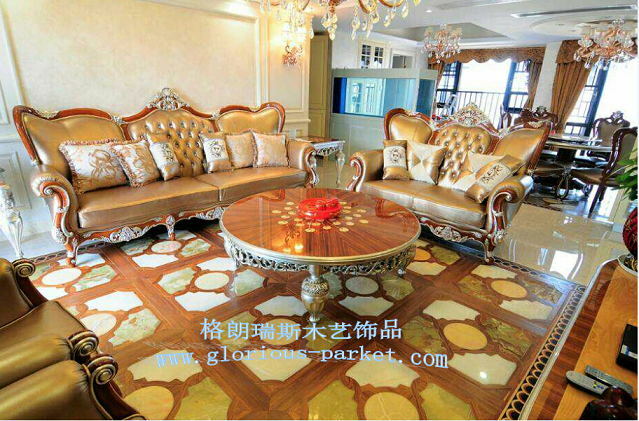 The parquet of such type is traditionally called a geometrical deocrative parquet. In some cases, to emphasize the decorative expressiveness of the parquet floor, the separate elements of the curvilinear form can be included into it. And they will harmoniously fit into a basic parquet set. Including of the parquet medallions and borders into the set contributes to the particular expressiveness of the decorative parquet floors.